(Left) Ghazal maestro Sudhir Narain and his daughter Kritika with consular staff. The Atlanta Indian Consulate continues to innovate and find new avenues to build strong relationships with the diaspora, and to widen contacts with the mainstream. Many initiatives have been undertaken to foster economic growth, trade development, cultural exchanges through performing arts, and international student exchange for education, one of the largest sectors of growth. The role of the Consulate is multifold, in serving the constituents, not just with the consular services component, but also to serve as India’s brand ambassador for all that is great and thriving in India. For the first time at the Atlanta Consulate, between Navratri and Diwali, the Cultural Officer and Consul, Community Affairs, Hon. Dharam Veer Singh and his team hosted “Irshaad,” an evening of light classical bhajans and ghazals by the Begum Akhtar Award recipient, Sudhir Narain. By earning this award, Sudhir Narain joined the ranks of ghazal maestro the late Jagjit Singh and the melodious Anoop Jalota, besides others legends in the field. 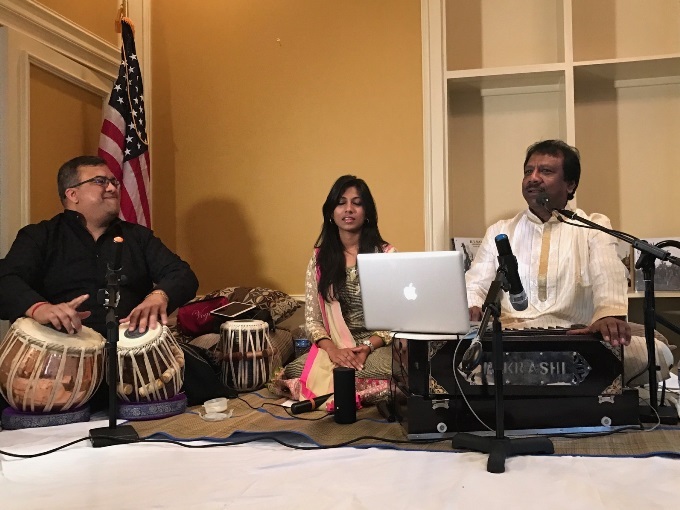 On Sunday October 16, 2016 in Atlanta, he was accompanied by his gifted daughter Kritika Narain on vocals and the very talented and always visibly happy Dexter Raghunanan on tabla. The consular staff welcomed all attendees most graciously, and Hon. D.V. Singh presented each of the three performers with a bouquet of flowers. The consular hall became a music auditorium with excellent sound. With a completely packed hall, the evening began with recitation of some of the choicest shayarees by Narain followed by some lighthearted ghazals including Faiz Ahmed Faiz’s “Kuch aur baat hoti.” The crowd was so engaged that before the completion of the para, the audience completed the lyrics in anticipation and were correct 90 percent of the time. Sudhir acknowledged that the audience was giving him their full attention. He continued with a palette of Sufi poetry (Rumi, Amir Khusrow) and very famous bhajans, including “Thumak Chalat Ramchandra,” “Aisi Lagi Lagan,” “Lazzate Gham Badha Dijiye,” “Jab Anchal Raat Ka Lehraye,” and then some. Kritika rendered a couple of solos and joined in the choruses as well. Dexter, as usual, was par excellence, and it’s a real treat to have him in Atlanta. In a rare move, when the affable Mustafa Ajmeri announced that the crowd should take a 15-minute break for refreshments and tea, they simply declined to move, yearning for more of the melodious music. However, the tasty delicacies of a vegetarian spread with samosas, pakoras, vegetable biryani with raita, fruit salad, and hot tea won the round. Everyone enjoyed the food to their heart’s content before returning to their respective seats to resume listening to the thoroughly enjoyable repertoire. The program closed with a very passionate bhajan in Raag Bhairavi, and the audience prepared to leave, the day after being a workday—but hesitatingly, as they felt they just could not get enough! Ghazal maestro Sudhir Narain and his daughter Kritika, accompanied by Dexter Raghunanan on tabla.